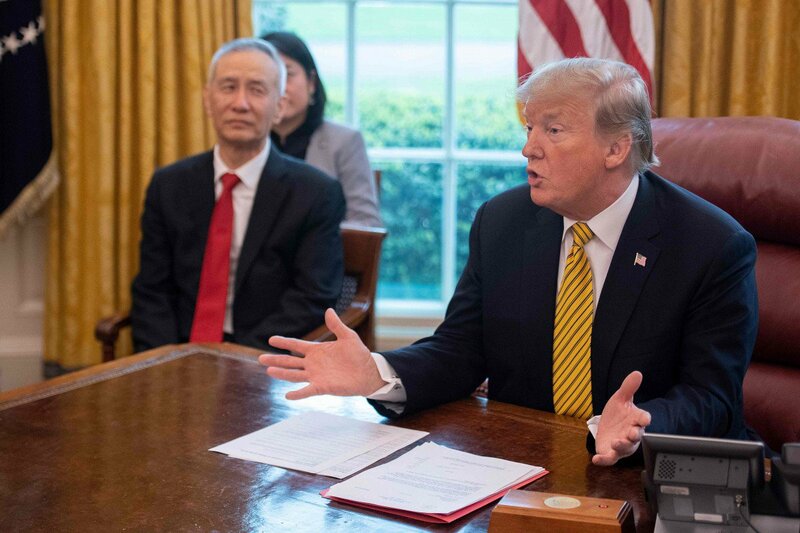 As the latest round of trade talks concluded in Washington and Chinese Vice Premier Liu He met U.S. President Donald Trump in the White House, Trump said there won’t be a summit meeting with Chinese President Xi Jinping if there is no prior trade agreement. China and the United States are “getting a lot closer” to making a deal following “fruitful consultations”, senior Chinese officials said, making progress on the text of an economic and trade agreement, but White House Spokeswoman Sarah Sanders said there was still “significant work” to be done. President Trump commented: “We’re getting very close to making a deal. That doesn’t mean a deal is made, because it’s not, but we’re certainly getting a lot closer. And I would think with, oh, within the next four weeks or maybe less, maybe more, whatever it takes, something very monumental could be announced. We’ve agreed to far more than we have left to agree to.” Chinese President Xi Jinping has said in a letter to Trump that a stronger strategic leadership from both China and the United States is needed to reach an “early conclusion of the negotiation”. White House Adviser Larry Kudlow said trade negotiators would continue their talks by video link. Some media reported that China had made several concessions, without however providing details. It is highly unlikely that China will make concessions that would undermine its own security and economic development, analysts said. Other so-called concessions have already been agreed to by China, such as prohibiting forced technology transfers and opening up China’s cloud-computing market to foreign companies. The Chinese government announced that it would continue to suspend additional tariffs on U.S. vehicles and auto parts after April 1, following a U.S. decision to delay tariff hikes on Chinese imports. It added that the suspension was aimed at creating a good atmosphere for continuing trade talks. In another small concession to the U.S., China tightened curbs on the manufacture of the painkiller fentanyl in response to repeated requests by the U.S., which has blamed Chinese imports for fueling the American opioid crisis that has claimed thousands of lives. But China refused to give up its status as a developing country at the WTO, as the U.S. is demanding. The status affords China “special and differential treatment”, enabling it to provide subsidies in agriculture and set higher barriers to market entry than more developed economies. “China’s position on WTO reform has been very clear. China is the largest developing country in the world,” China’s Ministry of Commerce (MOFCOM) Spokesman Gao Feng said. Myron Brilliant, Executive Vice President of the U.S. Chamber of Commerce, said that negotiations had now entered the ‘endgame stage’. “90% of the deal is done, but the last 10% is the hardest part to get there. It’s the trickiest part and it will require trade-offs on both sides,” he said. “Both sides have been pretty clear that they would like to wrap things up in April. Whether they can get here is going to be determined on the basis of whether they can handle these outstanding tricky issues,” he added. Brilliant said two “particularly sensitive areas” that have stood in the way is an enforcement mechanism that can hold China responsible for implementation of reforms it agrees to in the deal, as well as the removal of U.S. tariffs. In its latest World Economic Outlook report, the International Monetary Fund (IMF) said that countries looking to reduce trade imbalances should address their own macro-economic issues instead of launching barriers to trade. “Attempts to target one bilateral trade balance through tariffs or other distortions is likely to be met with offsetting changes in the trade balances with other partners.” The imposition of tariffs would make things worse. According to the IMF, the trade balance is largely determined by macro-economic factors, including fiscal policy, credit cycles and, in some cases, exchange rate policies and trade subsidies, and it is also a reflection of the international division of labor. These factors accounted for more than 95% of the change in the China-U.S. trade balance between 1995 and 2015, the IMF asserts. The IMF found that should the U.S. and China increase current bilateral tariffs to 25%, China’s exports to the U.S. would be reduced by 25%. U.S. exports to China, meanwhile, would crash by 36.4%. Such an increase would reduce the annual gross domestic product (GDP) by 0.6% in the U.S. and 1.5% in China, the study found.